AllSeated provides functionality, organization and attention to detail all in one place, eliminating the need for spreadsheets, PDF files, hand-drawn floorplans and seating charts! Event professionals are using technology more than ever before to plan wedding and events. Within AllSeated, all data is updated in real time and changes are easily made and stored, providing for the utmost in organization. Build and manage an event’s guest list within your AllSeated account. Include important guest information such as mailing addresses with the added options of grouping guests, assigning meal preferences and updating RSVP’s. AllSeated’s guest list even features the ability for your client to track guests and run reports, all in real time. The guest list is also used to arrange the event’s digital seating chart. 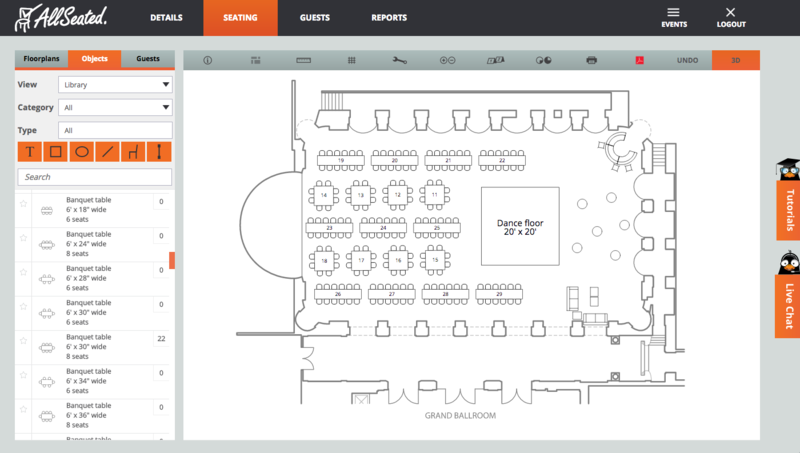 Easily build an event’s floorplan using a few of AllSeated’s simple tools. Select desired tables and furniture from the vast furniture libraries to arrange the event’s floorplan layout. Choose from a wide variety of objects within the objects library in order to create the floorplan layout that will meet your needs. Since AllSeated is a collaborative tool, all updates are made in real time and your client can see the latest changes and ideas that have been added to the floorplan. 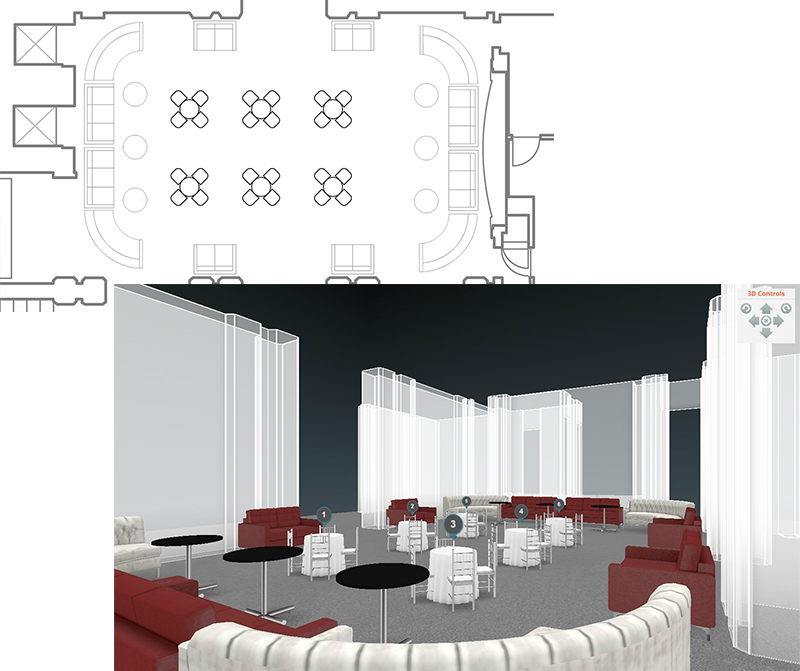 Work with your client in AllSeated on incorporating their changes to the floorplan and then view the floorplan in 3D to create a virtual walk through of the event! Once RSVP’s have been received, the digital seating chart can be created. It’s really easy to seat guests in the digital seating chart of the floorplan directly from the guest list. There are many options available to you as you create your digital seating chart. Guests can be seated at tables or assigned to specific seats at each table, depending upon how you wish to structure the event. You can also add or subtract the number of chairs at each table to meet your event’s specific needs. View every detail of your digital seating chart and floorplan including table placements, dance floor location, lounge area, and DJ booth in 3D to effectively see what your event will actually look like on the big day. Make use of AllSeated’s mulitple timeline feature by collaborating with your vendors within a vendor timeline. A vendor timeline will keep everyone working an event operating on the same page. The collaborative aspect of AllSeated’s timeline with everything updated in real-time assures that vendors involved on an event are kept current on all event details. The vendor timeline will allow for vendors to understand the flow of set up, event details and the timing of break down at the end of the night. AllSeated’s Day-Of Mobile App for tablets allows you access to the event on the go with a full check-in system including real-time collaboration, live check-in updates, overview of check-in status and ability to view your floorplans in both 2D and 3D. The day-of Mobile App also allows you to let your guests know where they are sitting via check-in. Simply enter a guest’s name and their seating information from the digital seating chart will pop up.